When their son wanted join the Northstar California ski team, a Carson City–based couple decided to move to Incline Village, living in a rental while they looked at real estate. The couple, who wish to remain anonymous, wanted something private but nice, a fulltime house they could live in for the rest of their lives. They shopped around before touring the secluded, gated home off Lakeshore Boulevard. “The realtor said, ‘I could show you this house, but you’re not going to like it,’” the wife says. The home was originally the guesthouse for philanthropist Warren Trepp’s lakefront estate. Though far from perfect, it had a lot of possibility. “I thought, ‘We could do something with this,’” the wife says. Like the homeowners, the lot is private. 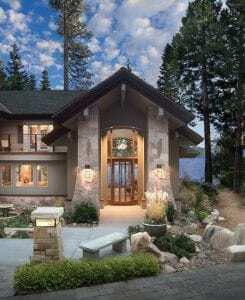 It hugs a section of Lake Tahoe’s rocky shoreline, in a cove that sees little summertime boat traffic, but offers panoramic views. The biggest problem with the house, the homeowners say, was the separation between the main part and the garage/mudroom space topped by a game area, which were connected by a strange hallway. But the house had other problems as well: an unwelcoming entryway, a raised patio that discouraged a flow between the outdoor living space and the lawn, a dark, tucked-away kitchen, and divider walls that blocked views and made the spaces feel smaller. Still, the homeowners knew the location was special, and purchased the lot in April 2013. “We weren’t in love with the house; we were in love with the lot,” the wife says. Through their synagogue, the homeowners contacted contractor Tom Grossman, of Truckee’s GLA Morris Construction. “I told him in no uncertain terms I wanted a fair price, but wanted things done quickly,” the husband says. Grossman recommended the couple to Incline Village architect Elise Fett. Fett began by redesigning the interior, for example popping the kitchen into a central location outside of the original floor plan in what had essentially been dead exterior space. The old kitchen became an office/den. She moved the hall stairs that connected the two areas of the home, allowing for an improved mudroom on the ground level as well as an upstairs connector between the spaces. 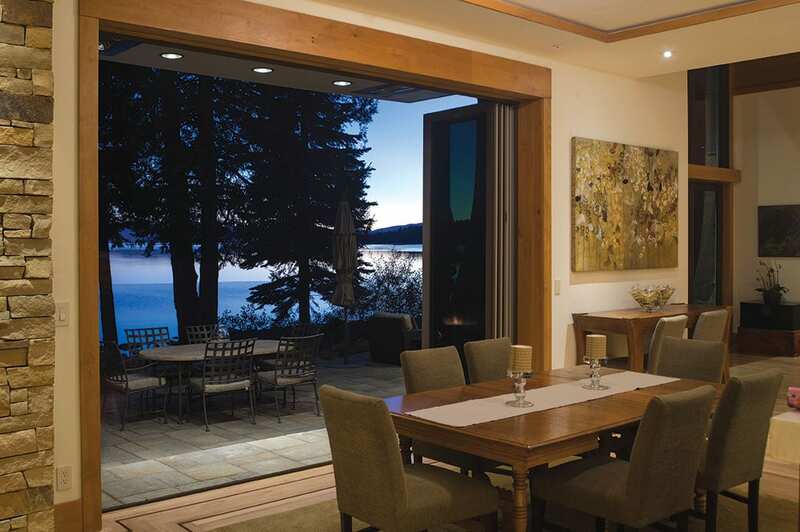 She created a lowered patio, which allowed the homeowners to enjoy unobstructed views of Lake Tahoe and the surrounding mountains rather than of the outdoor furniture. She removed walls and analyzed everything from bed positioning to the height of the ceiling lamps to maximize the home’s views. “It was brilliant what Elise did,” says the wife. The husband agrees. He’d never built or remodeled before and says he first thought some of Fett’s designs seemed unnecessary—a beam that Fett argued to get from 14 inches to 9, for example, or her insistence on opening more views to The Lake. Construction began in July 2013 and, in April 2014, the couple moved into their remodeled home. Guests enter through a wood-and-glass front door, which offers see-through views to The Lake beyond. 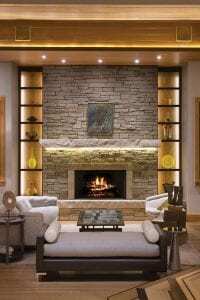 In the tall great room, Colorado ledgestone—the warmth and richness of which remind the couple of their native Minnesota—on the fireplace hearth and surround rises to the ceiling to match the scale and grandeur of the room. NanaWall doors slide open to the lowered patio and Tahoe’s gorgeous shades of blue. Indirect lighting runs throughout. The original oak floors, complete with walnut inlay, were refinished to a more natural color; where the floor plan was changed or square footage added, the construction team matched the original perfectly. Fett credits GLA’s Grossman and Joe Morris, who took over after Grossman’s death. The now-central kitchen is bright and warm, with a substantial marble island and walnut cabinetry. The kitchen steps down to the dining and living room, both of which boast the same awe-inspiring views. 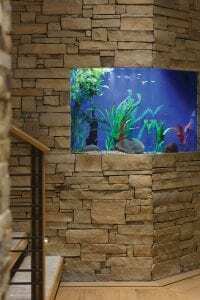 Near the entrance to the office and the stairs, an aquarium is built into the stone wall, a cool counterpoint to the fireplace of the open great room. Upstairs, the home includes his and hers’ master suites—his with two well-sized balconies and built-in storage; hers with a luxurious bathroom and swoon-worthy closet—as well as a bedroom for the couple’s daughter, a laundry area built into the connector hallway, and an additional bedroom and the game room, which includes a kitchenette. That area, says Fett, who stresses the importance of designing homes to grow old in, could eventually be used for a caregiver, while the downstairs den could potentially function as a bedroom if stairs ever become difficult. Though this project was certainly a team effort between contractors and sub-contractors, Fett gives much of the credit to the homeowners. “They have such great taste,” Fett says, but the wife interrupts. “The process was so easy because you respected my taste,” she clarifies. To create the perfect home, that respect and collaboration made all the difference.